Afghan first vice president, a former Uzbek warlord, Gen. Abdul Rashid Dostum, center, and members of his entourage arrive at Kabul International Airport in Kabul, Afghanistan, Sunday, July 22, 2018. An Afghan spokesman said there has been a large explosion near the Kabul airport shortly after Dostum landed on his return from abroad. 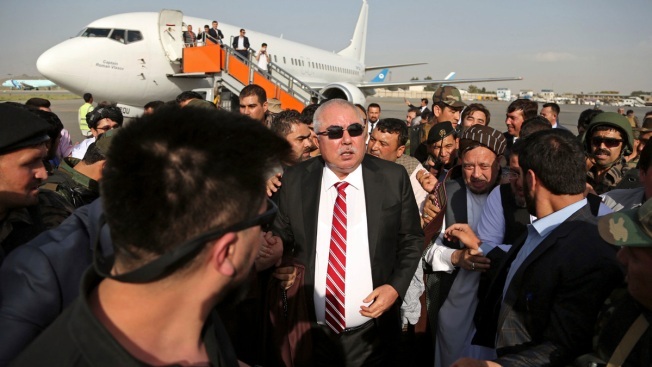 Dostum and his entourage were unharmed in the explosion which took place after his convoy had already left the airport. A suicide bomber carried out an attack near the Kabul airport Sunday, killing 14 people and narrowly missing Afghanistan's vice president, who was returning home after living in Turkey for over a year, security officials said. The blast occurred near Kabul International Airport shortly after the convoy of the controversial vice president had just left the airport, Interior Ministry spokesman Najib Danish said. Gen. Abdul Rashid Dostum, a former Uzbek warlord, and his entourage were unharmed, said Danish. Danish said that 14 people, including both civilians and military forces, were killed in the attack and 50 others wounded. 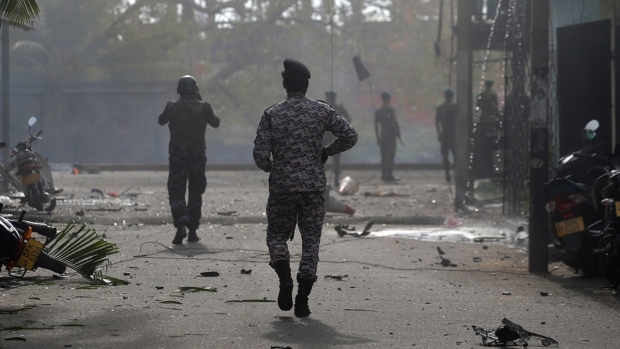 The Islamic States group's local affiliate claimed responsibility for the attack on its Amaaq News Agency website, claiming it had killed and wounded over 115 people. In a statement from the presidential palace, Afghan President Ashraf Ghani strongly condemned the attack. Dostum had been undergoing medical treatment in Turkey and is now well and ready to resume work, said presidential spokesman Haroon Chakhansuri. Dostum left Afghanistan in 2017 after the attorney general's office launched an investigation into allegations that his followers had tortured and sexually abused a former ally turned political rival. He has since reportedly been barred by the government from returning to Afghanistan. "The judiciary in Afghanistan is an independent body and will carry out its duties and responsibilities as it deems appropriate," said an official, speaking on condition of anonymity because he was not authorized to comment on the issue.